Welcome to Mentor for Bank Exams. 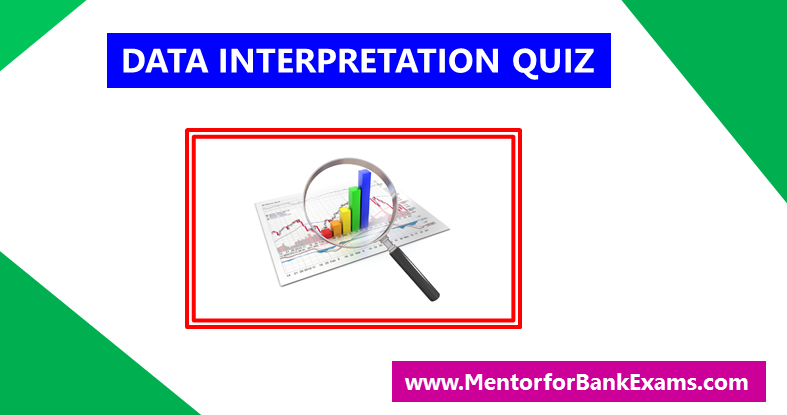 Data interpretation is quite different from the other fields tested in the Competitive examinations. Data interpretation or DI as the name suggests tests your ability to perceive data and use the data given to you in the most efficient manner. More practice is the only key for success in DI. So here we have collected 3 sets of Data Interpretation Questions (Prelims Level) for your practice. Let the stop watch run in-front of you and solve the questions if your attempt for 10 questions correctly is more than 8 minutes then you are in danger zone and practice more DI Questions here. 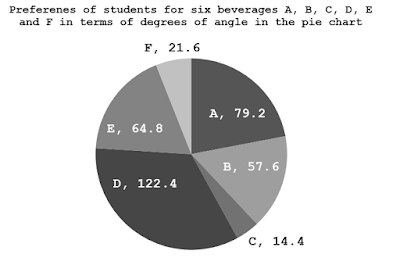 Directions (1 – 5): Study the following pie chart and answer the questions given below. 1. What is the difference between the total number of students, who prefer beverage A and B together and the total number of students who prefer beverage D and F together? 2. What is the ratio of the number of students who prefer beverage F to the number of students who prefer beverage A? 3. The number of students who prefer beverage E and F together is what per cent of the total number of students? 4. The number of students who prefer beverage B is approximately, what per cent of the number of students who prefer beverage D? 5. How many students prefer beverage B and beverage E together? Directions (6 – 10): Study the following graph carefully and answer the questions given below it. 6. In which of the two years, the no. of female Android mobile users are equal in the given time period? 7. The no. of female Windows mobile users is approximately what percent of the no. of female Android mobile users in 2006? 8. Find the difference between the no. of female Android and Windows mobile users in that year in which the percentage of female Android and Windows mobile users is equal? 9. What is the ratio between the no. 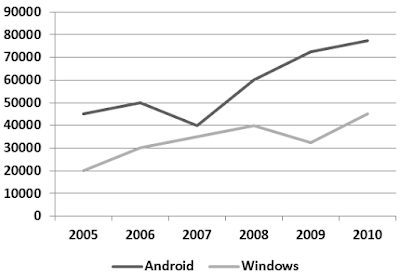 of male Android and Windows mobile users in 2009? 10. What is the average no. of female Windows mobile users in 2005, 2007 and 2010? Directions (11 – 15): Study the given bar-graph and answer the related questions. The bar-graph represents the strength of employee in four departments on a company on during years 2011 – 2015. 11. What was percentage increase in department of HR employee in 2012 over 2013? 12. In which year, the strength of employee in department of accounts was minimum? 13. How many times was the total strength of the strength of employees in department of IT in 2011? 14. What was the percentage of employees in department of operation in 2015? 15. What was the percentage of employee in department of HR in 2012? ∴ We can clearly observe that the no. of female Android mobile users are equal for the years 2008 and 2009. ∴ The required percentage = [(3600/13500) × 100]% = 26.66% ≈ 27%. 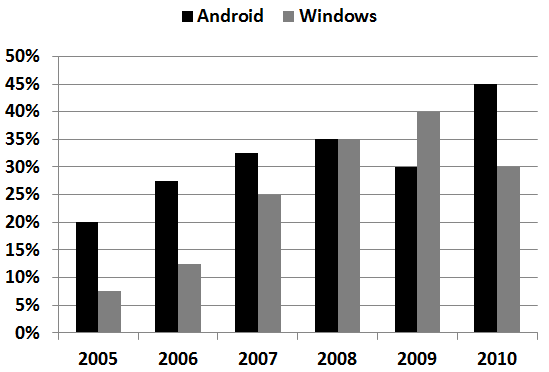 We can find the year in which the percentage of female Android and Windows mobile users is equal from the bar graph. In 2008, the percentage of female Android and Windows mobile users is equal i.e. 36%. ∴ The difference between the no. of female Android and Windows mobile users in that year in which the percentage of female Android and Windows mobile users is equal = 21600 – 14400 = 7200. ∴ The required ratio = 50400 : 19200 = 21 : 8. 12. D) The strength of employee in department of accounts in 2011, 2012, 2013, 2014 and 2015 was 220, 80, 250, 200 and 150, respectively. So, the strength of employee in department of accounts was minimum at 2012.